The Visual Studio designer for WPF is quite lame as it stands now, and although it will get a lot better when Visual Studio 2008 SP1 is released, if you’re a WPF developer, you really need to know how to read and write XAML by hand, much like web developers and designers know how to read and write HTML and CSS by hand. Since you’re not a wussy, what you actually want is for Visual Studio to always show a full view of the XAML markup when you open a XAML document. It’s also a good thing because you won’t have to wait for a few seconds for the designer to load the first time. To do this in Visual Studio 2008 Express, go to the Options dialog, check “Show all settings”, and go to “Text Editor”, “XAML”, “Miscellaneous”. 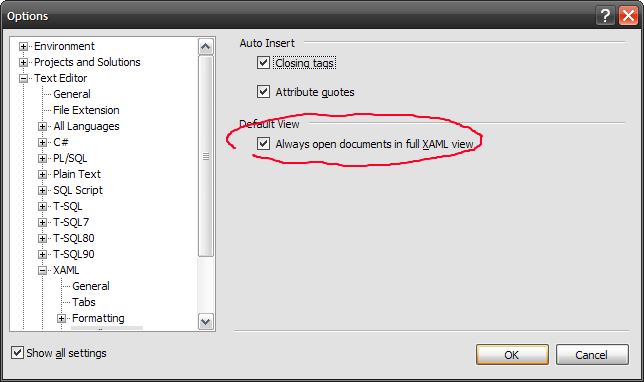 There, check the “Always open documents in full XAML view”.